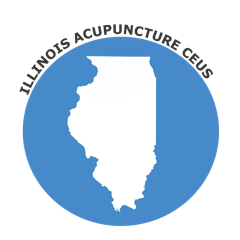 The state of Illinois accepts NCCAOM Approved Acupuncture PDAs/CEUs. For reference, please see Illinois Administrative Code, Title 68: Professions & Occupations, Section 1140.90 Continuing Education, Section c (F). The state of Illinois requires 30 Hours of continuing education (CE) relevant to the practice of acupuncture. A renewal period is 24 months preceding June 30 of each odd-numbered year. A maximum of 23 hours of CE credit may be earned in a pre-renewal period for completion of self-study (including online, correspondence, audio or video) courses that are provided by a sponsor approved by the Division pursuant to subsection (c).Herb courses do not count towards the 30 hours. To browse NCCAOM approved courses, please visit the NCCAOM CEU Page. 1 ) A maximum of five (5) hours of self-study (including online) offered by an approved sponsor; each self-study course must include an examination. 2) A maximum of five (5) hours of postgraduate training programs or courses offered as part of the curriculum of an approved acupuncture school. 3) A maximum of five (5) hours for verified teaching in an approved acupuncture program or in a CEU program offered by an approved sponsor; the credit will be applied at the rate of 1.5 hours for every hour taught and only for the first time the material is presented. 4) A maximum of five (5) hours for authoring publications and making presentations before a professional audience; the five (5) hour credit may be claimed only the first time the information is published or presented. ACE will provide certificates of attendance. Keep your certificates for at least five years. On the State of Illinois acupuncture license renewal application, you will be asked to certify that you have complied with the CEU requirement, but you will only need to submit your documentation if you are requested to do so by the Department of Professional Regulation. When CEU hours are earned in a different state other than Illinois from an unapproved sponsor, you are required to submit an out of state CEU approval form, with a $25.00 processing fee prior to attending the program or 90 days prior to the expiration of your license. If you did not submit the out of state CEU approval form within the time allowed, you can obtain late approval by submitting the approval form plus $25.00 processing fee plus $10.00 per hour late fee, not to exceed $150.00. The Board of Acupuncture reviews these forms and recommends approval or disapproval of the program. Updated 12/14/17: You may visit the Illinois Association of Acupuncture & OM website all information.